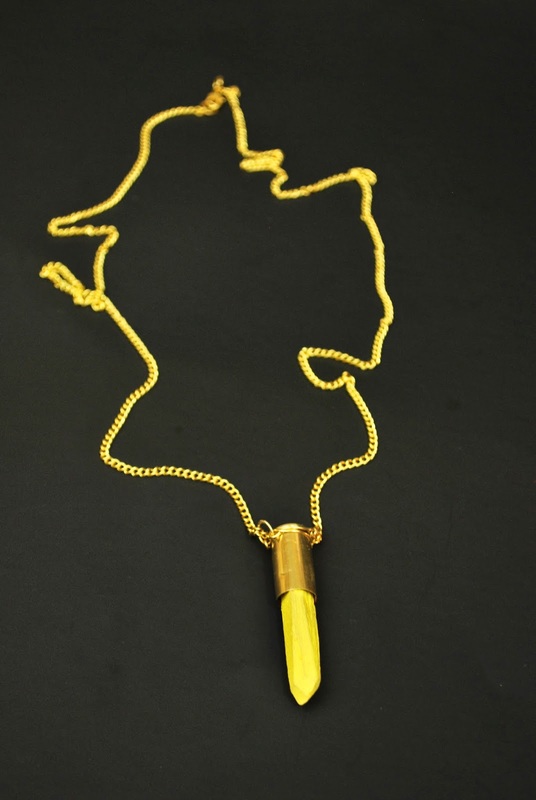 We've had these bullet shell casings for a verrrry long time and had intended on making necklaces out of them for a very long time. Once we realized that we didn't have the right tools to drill a hole in the casing, we kind of just gave up. But then one day I decided I was going to figure it out. So this is what I did. Start by shaving off some of the wood in a haphazard way. Make sure the piece of wood fits in the casing. Shave off the end of the wood into a more pointed shape. Spray paint the wood pieces. Put some glue on the end of the wood. Then put the wood back into the casing to stay. Wrap your wire or pin around the indented part of the casing and round the end off. Do the same with another pin and the attach the pins, on matching sides, with jump rings. This will ensure that the bullet will hang the right way when you wear it. Cut the chain to the length you would like and loop it through the two jump rings. Attach the lobster claw to one side of the chain with a jump ring and attach just a jump ring to the other side. And voila! A fun little necklace. Oooh that looks so neat! I imagine that would look super nice with some precious stones instead of wood. :) Great idea! Really cool DIY. Where can I pick balsa wood? I love this!!! This is such a cute idea. How did you get the shell casing though? I thought about going to a local gun range and asking if I could have their casings but I don't know if that would be weird or not. I love this idea though!